Delivery from £14.82 to United Kingdom in 6 - 10 working days. The Hockenheimer is comprised of a wooden base made of birchwood, extra-long split leather straps with two riveted metallic clasps, and a pillow covered with high-quality upholstery fabric. Anyone who consumes magazines with the voracity that we do will, at some point, have encountered the problem of what to do with your subscriptions once you’ve read them. You can’t throw them away of course – suppose you suddenly need to lay hands on a vital piece of information that’s long been shredded and mulched? Unacceptable! But you can’t just leave them hanging around the house either, taking up valuable space that should really be full of potted plants and stylish furniture. But what if there was a way of turning you magazines INTO stylish furniture? Let’s cut to the chase now, there is! 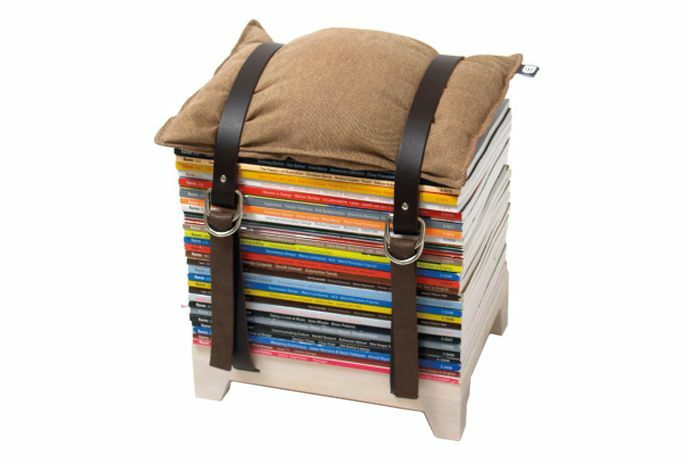 NJUSTUDIO have found a way of transforming an unsightly magazine stack into a classy piece of seating, and all it required was a couple of leather straps and a cushion. The Hockenheimer (for that is its name) comes in two different sizes, based on standard publication formats, and can be stacked as high as the leather straps will allow. So now you can show off your impeccable taste and intellectual prowess at the same time. Excellent! The wooden frame is handcrafted by a carpenter in Coburg, Bavaria, and the nju-pillow is lovingly handmade. njustudio products meet the need for more than bare function: They are food for thought on issues of our post-modern life – they create links to individual experiences and memories.